Another book this week from the energetic folk at Maverick House which has an office in Bangkok. 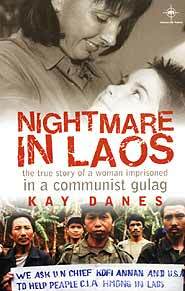 Nightmare in Laos (ISBN 1-905379-08-0, published this year) tells the horrific tale of Australians Kay and Kerry Danes who were imprisoned by the Laos authorities, their ordeal during incarceration, and the subsequent efforts to get them released by the Australian government. Thrown in jail, the advice given to them was “Be patient”, a very prevalent Asian response. However, it was difficult for two westerners to quietly accept such ‘karma’. The book chronicles an international game of cat and mouse at government levels, where international diplomacy continues roughshod over humanity. Kay Danes in her acknowledgment at the front of the book thanks the Australian government, but there is no doubt in my mind that there was too much kow-towing to its Laos counterpart, which was prepared to tough it out, rather than seek an immediate face saving situation. The impasse which ended up with a discussion of semantics as to whether accepting the decisions of the Laos court was actually an admission of guilt or otherwise left the Danes with no alternative, other than to sign the document showing acceptance of the Laos court and their (assumed) guilt. This in itself was a psychological conundrum for the two people concerned. A ‘damned if you do or damned if you don’t’ situation. That Kay Danes showed Post Traumatic Stress Disease afterwards was not surprising. The end to their incarceration came with a bilateral government brokered “pardon”, with the Laos Foreign Minister saying, “We are happy that both governments have been able to resolve this situation in the best interests of the long standing relationship our countries share.” Read the book and you will be totally nauseated at such a public display of hypocrisy. At B. 495 it is not only an inexpensive primer into understanding the workings of governments and officialdom, but also manages to show the strength of disparate individuals against the shallow background of so-called strength in leadership. Every day, the prisoners were exposed to the dogma “Trust the (Laos) government to know the way to be perfect for the future. Follow their wisdom to see the way forward. Do not question their knowledge or the way they do everything because they defeated the Americans in the war, alongside our Vietnamese brothers.” Unfortunately for the originators of such drivel, they ignore the basic need for human beings to retain their unique individuality. Kay Danes managed to retain hers, despite the enormous psychological stress, and the fact that she not only endured, but has also now dedicated some of her life to helping political prisoners throughout the world shows wonderful moral fiber. A disturbing book, but good value and a good read. There has been a band going under the Uriah Heep banner now since 1969, and no one can take away their influence on hard rock music. Only Mick Box survives from the original line up, but combining his undeniable popularity with musical skill on his chosen musical weapon, the modern electric guitar, a great vision of what the customer wants, and an incredible faith in his ability to succeed within the band, he has kept the band going through all the sticks and arrows that have been thrown at them. The line up of the band today, Mick Box on lead guitar, Trevor Boulder (ex-David Bowie’s Spiders from Mars, and Wishbone Ash) on bass guitar, Phil Lanson on keyboards, Bernie Shaw on lead vocals and Lee Kerslake on drums (Lee has been with the band since the fourth album, only missing one along the way after a spat with keyboardist Ken Hensley, but when he left the band it left an easy way for Lee to come back as he had just been evicted from ‘Ozzy Osborne’s Blizzard of Oz’) have now been together for over twenty five years, but it certainly was not like that at the beginning. In their early days Uriah Heep was one of the main bands that gave the inspiration to the ‘Rockumentary’ Spinal Tap, one of the finest comedies ever made about rock culture, with its self combusting drummers, revolving stages, and dramatic band break ups. Uriah Heep had five different drummers before their fourth album, to be fair the fifth was Lee Kerslake, who became the fifth and seventh drummer after Chris Slade stepped in for the ‘Conquest’ album, before going off to ‘The Firm’ with Paul Rogers and Jimmy Page. Throughout their careers, Uriah Heep has had five lead singers, four keyboard players, six bass players, but only one lead guitarist - good old Mick Box who today looks more and more like one of the wrestlers from the American wrestling series than ever, although he still plays a mean guitar. Uriah Heep was formed in 1969 by taking the four members of the band ‘Spice’ - David Byron on lead vocals, Paul Newton on bass, Alex Napier on drums, Mick Box on lead guitar, and adding Ken Hensley on keyboards to add an extra dimension to the instrumentation and the writing skills of the band. Ken Hensley had been in ‘Toe Fat’ with Cliff Bennett and a certain Lee Kerslake. ‘Look At Yourself’ (1970) still is to many the ultimate Uriah Heep and hard rock album. The cover is great, it’s a mirror, look at yourself! Get it? Opening with the title track it hurtles out of the tracks like some demented heavy metal demon. Hensley and Box thrash out the song’s riff before the wonderfully strong voice of David Byron calls his brethren to the cause, the rest of the band harmonizing behind him, then after a rampaging guitar solo, the riff is picked up again to bring the song to a rousing crescendo with the percussionists from ‘Osibisa’ brought in to add their sound to the climax. This time the session musicians were used to good effect. The pace is not let up by the following song, ‘I Wanna Be Free’, as the chorus is driven along by a pounding beat, but with sympathetic vocals and fine musical flourishes, with all the guitars in the band standing out. At track three is probably Uriah Heep’s most famous song, ‘July Morning’, a song that no version of the band could ever contemplate going on stage and not playing before they leave. It must have also been licensed out to every ‘Best of Hard rock albums’ ever made. After Ken Hensley’s strident organ chords open the song up, Mick Box takes the song to a higher level with some truly rockin’ guitar, before the whole thing is brought down to allow the vocals of David Byron to take over. The song is a loving ten minutes long, showing the full range of all the soloists, building to many crescendos before reaching a dramatic conclusion with everybody having a go at the solos and Manfred Mann brought into the studio to add his deft touch on the moog synthesizer - a classic rock song. The following songs on the album are not an anti-climax. ‘Tears In My Eyes’ is a great little rock ‘n’ roll song with lots of loud guitars, and the harmony vocals would not do shame to any of the great American vocal groups of the Fifties. ‘Shadows Of Grief’ is another epic song that perhaps never gets the recognition of some of its peers, maybe this is because there just was not room for it in the live set with all its twists and turns, but it is like a hidden treasure on the album. It has aged very well even though it still glorifies in the use of stereo with all the instruments and vocals switching from one speaker to the other in dramatic fashion, as if the band had found a new toy to play with. Finally the band drops the pace a little, as if needing to catch their breath, with the beautiful ballad ‘What Should Be Done’. There is nothing wrong with having one ballad on a rock album as long as they do not dominate proceedings. The album is brought to a rollicking conclusion by ‘Love Machine’, a number that just rocks, bringing the music to a conclusion as it did Uriah Heep’s live set at the time. 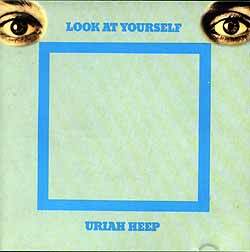 A job well done, ‘Look At Yourself’ was the first Uriah Heep album to break into the American Top 100 and the British Top 30. Of course the band would hit pay dirt with the next year’s ‘Demons and Wizards’ album, but would it all have been possible with out a good look at yourself? Over the next thirty years Uriah Heep did make some awful yawn inducing albums (like ‘Fallen Angel’ in 1978). But make no mistake, ‘Look At Yourself’ is a diamond hard jewel.